POINT BLANK REMAKE? NOT EVEN CLOSE! “POINT BLANK REMAKE” blared the headline in Variety. Of course, my initial reaction to the headline itself was one of mixed emotions. While glad to see attention was being paid to Lee Marvin’s neo-noir classic — which could enliven his work to a wider audience — I bemoaned the lack of originality constantly being shown by Hollywood bigwigs. 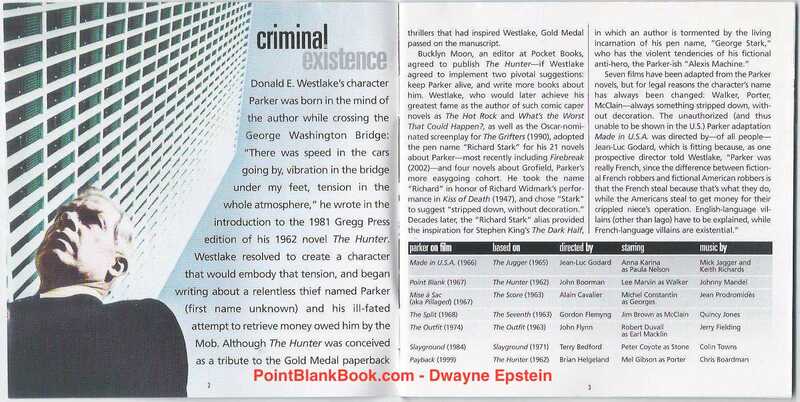 After all, Even Point Blank itself, was not the first version of Richard Stark’s (aka Donald Westlake) mysterious character…. 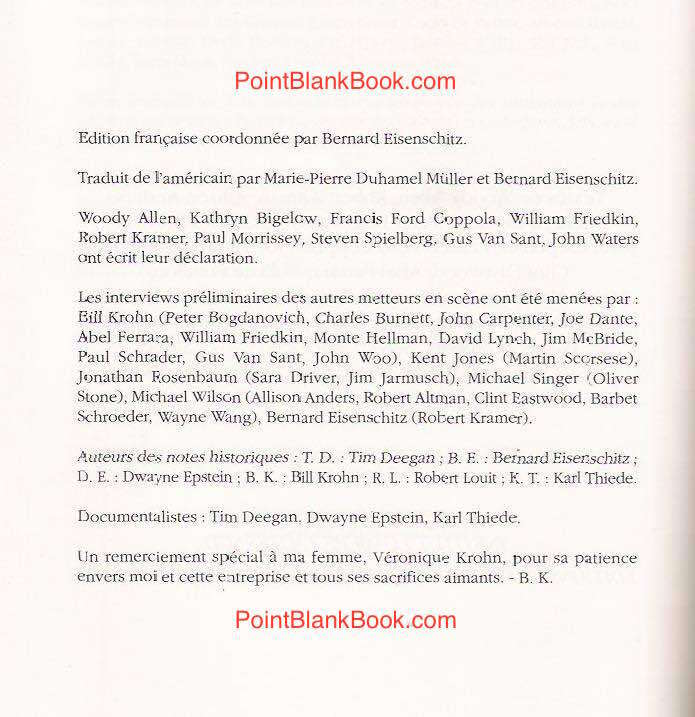 Liner notes from the POINT BLANK soundtrack CD describes the films genesis, as well as a graph of its many incarnations. The only one missing since the CD’s release is Taylor Hackford’s PARKER (2013), starring Jason Statham. Then I actually read the article. Never heard of a 2010 version of the same title with a completely different premise. Never heard of Fred Cavaye. Never even heard of Frank Grillo. How in god’s name did they get away with naming a non-related film Point Blank...and then make an announcement to remake it? Bizarre! By the way, readers of Lee Marvin Point Blank are well aware of Lee Marvin’s complete immersion in the John Boorman original, as well as the films evolution to the screen and its current well-earned cult status. Those who haven’t read it are in for an eye-opener! Original ad art for two of several versions of Richard Stark’s original tale that would make a great double feature. Actor Anthony Mackie drawing a bead on the enemy in Kathryn Bigelow’s THE HURT LOCKER. That point may seem off topic, but in truth it is definitely worthy of a mention in a Lee Marvin-themed blog. No one can really tell for sure but it’s a pretty safe bet Lee Marvin himself would have been impressed with both Mackie’s performance and the film itself. It’s dealing with the current veteran’s trauma of PTSD and Bigelow’s unflinching detail of it would definitely be in Marvin’s wheelhouse. With such films possible, why a Point Blank remake….that isn’t even a Point Blank remake? Boggles the mind. Better yet, how about a biopic on the man who put Point Blank on the map…and endured a lifetime of grappling with PTSD? Just a thought. The first of April is known to most folks as April Fool’s Day (or Easter this year!) but to some observant film fans it also the birthday of Lee Marvin’s favorite co-star, Toshiro Mifune. Lee Marvin Point Blank readers are well aware of Marvin’s feelings for Mifune. 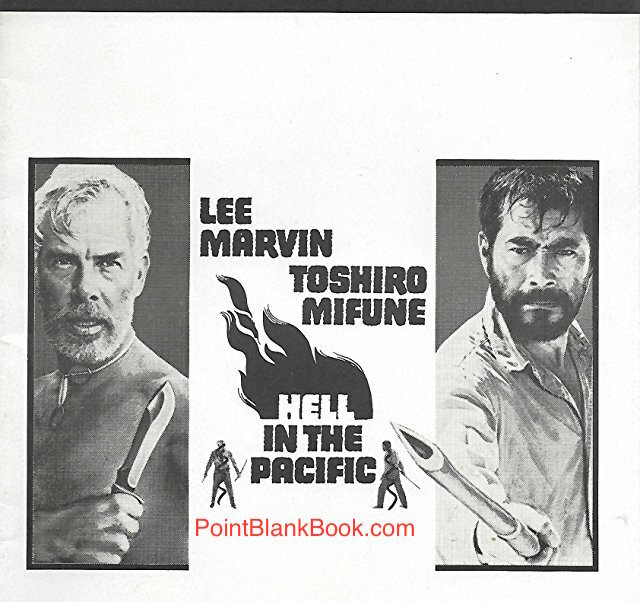 Original release ad for HELL IN THE PACIFIC, Marvin & Mifune’s only film together. Marvin’s affection for Mifune was rare for a man of his generation and despite the difficult circumstances during their one project together, their friendship grew and lasted until Marvin death in 1987. 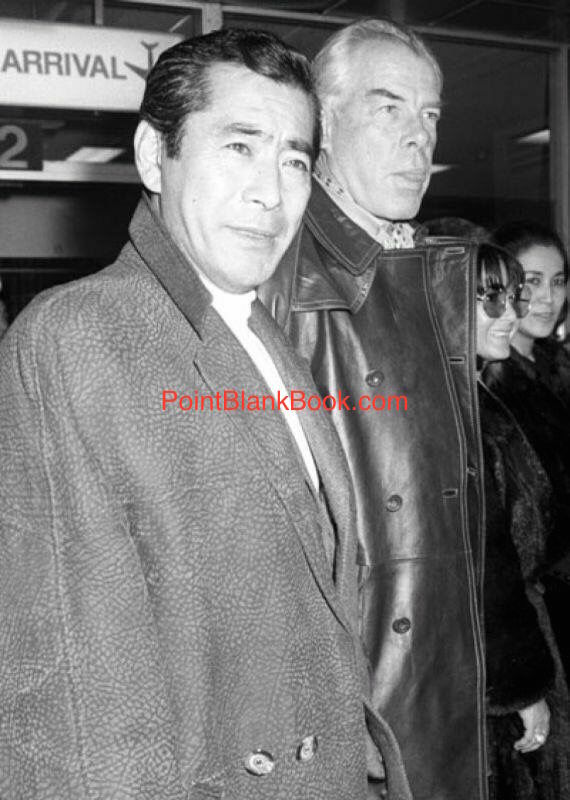 (L-R) Toshiro Mifune, Lee Marvin, Michele Triola and Mifune’s wife, Sachiko Yoshimine. Of the one film they made together, Hell in the Pacific is given it’s just due in Lee Marvin Point Blank. Other sources for its production are detailed in director John Boorman’s memoir, Adventures of a Suburban Boy and Stuart Galbraith’s IV mammoth tome, The Emperor and the Wolf: The Lives and Films of Akira Kurosawa and Toshiro Mifune. Personally, I found it to be a noble failure as both allegory and filmmaking. Upon the heavily edited version released to theaters at the time, Marvin himself felt the same way but, despite it’s reception, it remained on of his personal favorite films. It’s not without its merits, chief among them being the two actors’ presence and the eye-popping cinematography of Conrad Hall. 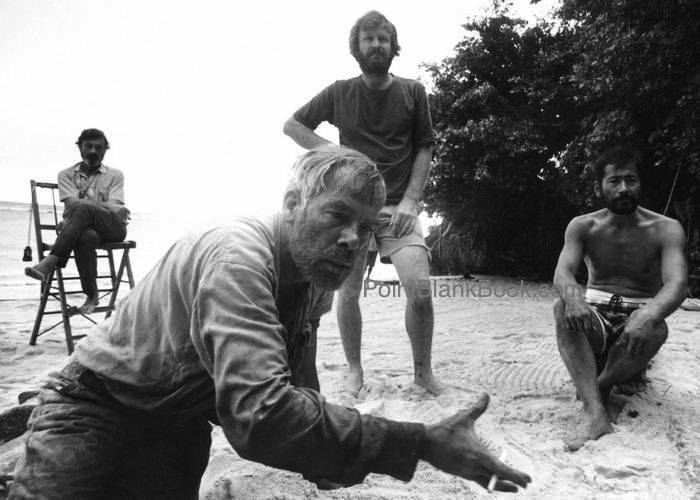 (L-R) Cinematographer Conrad Hall (seated), Lee Marvin, director John Boorman and Toshiro Mifune on location during HELL IN THE PACIFIC (1968). While Galbraith and Boorman give wonderful accounts of the rigorous production, both seem to lack insight into the one element that seems to accompany any Lee Marvin project, and that is humor. Thanks to exclusive interviews with Lee’s first wife, Betty Marvin and his career-long agent, Meyer Mishkin, I was able to secure several hilarious anecdotes to put in my book that would have been lost to time had they not agreed to open up to me. Still in all, Hell in the Pacific is worth viewing, if only for the powerful presence of both Marvin and Mifune, two actors at the top of their game in a film personal and important to them both. Watch it again for the great Mifune’s heavenly birthday and when Marvin shouts out “Come and get it!” raise a sakazuki in the great man’s honor. 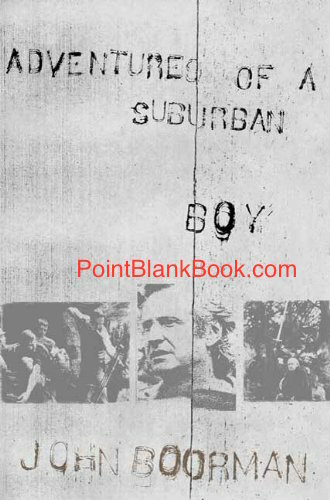 Director John Boorman’s 2003 memoir, Adventures of a Suburban Boy. 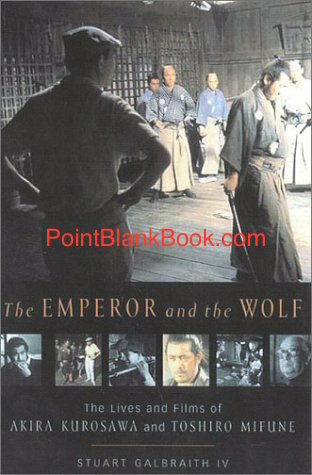 Author/Historian Stuart Galbraith’s massive 2001 tome, The Emperor and the Wolf: The Lives and Films of Akira Kurosawa and Toshiro Mifune. True confession time: I was not a fan of Lee Marvin’s Point Blank (1967). The first time I viewed it, I found it slow and pretentious. Of course, like all truly great films, it grew on me with each successive viewing and has since become one of my favorite films in his canon. What helped immensely was the research I did while writing Lee Marvin Point Blank. However, film historian and good friend, Bill Krohn, also aided my appreciation of the film considerably when he asked me to help research a project he was working on….. 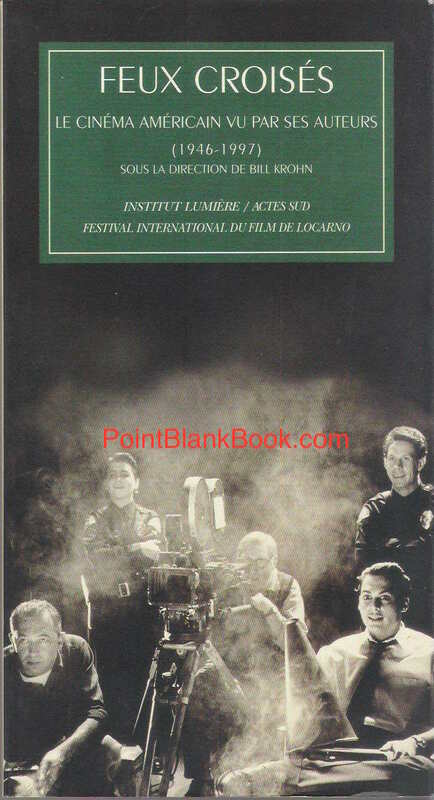 The cover of Bill Krohn’s French film book which translates to SERIOUS PLEASURES. Krohn was commissioned by Switzerland’s Locarno Film Festival to put together a project in which several great film directors pick an underrated film to discuss, why the picked it, and was worthy of rediscovery. It was dubbed Serious Pleasures, a sort of play on words of Film Comment’s series entitled, “Guilty Pleasures.” The choices were very impressive as Bill also needed help in researching and writing some background pieces for each film. I wanted to do almost all of them, but had to settle on a choice few, of which Point Blank was one, chosen by Wayne Wang (The Joy Luck Club, Eat a Bowl of Tea, etc.). My pleading with Bill resulted in being able to write about Woody Allen’s choice of Sidney Lumet’s The Hill (1965); Francis Ford Coppola’s choice of Marlon Brando’s One-Eyed Jacks (1961); Clint Eastwood’s choice of Raoul Walsh’s White Heat (1949); Oliver Stone’s choice of Robert Wise’s The Sand Pebbles (1966); Kathryn Bigelow’s choice of Sam Peckinpah’s The Wild Bunch (1969); Jim McBride’s choice of Otto Preminger’s In Harm’s Way (1965); and Charles Burnett’s choice of Frank Perry’s The Swimmer (1968). All great choices, by the way, and the joy I felt in researching them was the reason I chose this profession. Unfortunately, the collection never saw publication in this country and I had to be content with knowing my work was enjoyed by film fans throughout Europe…only! My research into Point Blank resulted in the following brief background piece. 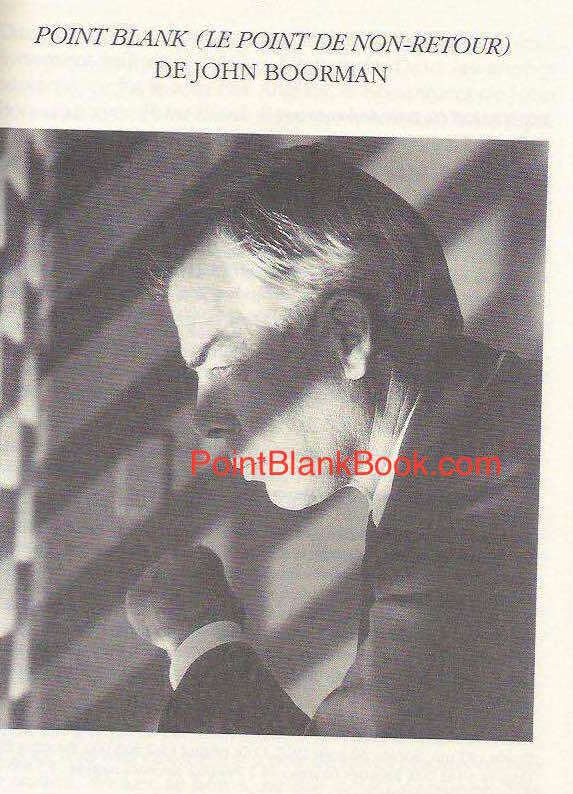 Readers of Lee Marvin Point Blank may recognize some of the documentation but there are a few choice nuggets that may be new. Find out for yourself below. Enjoy! The highly stylized film boasts many technological advancements, as well as some of the most memorable images of its knd. The reverberating sound of Marvin’s heels echoing through the airport during the opening, or the juxtaposing of a brutal fistfight during a hip, should music riff still pack a wallop. Although it is not widely known, Point Blank is also the first film to mic all the actors individually during a scene, thereby incorporating a greater sense of intimacy. The production, the first ever shot with extensive sequences on the then recently decommission prison of Alcatraz, was not without incident. The difficult task of obtaining permission to shoot on ‘The Rock’ was secured by promising government officials that the film would not glorify crime. Once that was accomplished, the filmmakers took over the decaying prison, shooting long into the night. One shot included a love scene between Marvin and actress Sharon Acker in what had been the cell of Al Capone. At one point, the production almost lost a script girl who slipped on an oil-slick barge into San Francisco Bay’s choppy waters. The female lead, Angie Dickinson, made a pointed observation when it was screened at the Los Angeles County of Museum in 1996: “It’s been taken to task for its violence but if you notice, Lee’s character never really kills anyone, except for a car and a bed. He really is a catalyst for violence, not a perpetrator.” Her observations gives credence to those film buffs who argue that Marvin’s character is actually the Angel of Death. Title page for SERIOUS PLEASURES Point Blank chapter. Rarely has art imitated life so creatively.